John Thomas Grant is the artist behind the exquisitely photographed book Final Thoughts: Eternal Beauty in Stone. He currently has two solo exhibitions of his photography in progress: one through October 28th at the Cahoon Museum of American Art in Cotuit, Massachusetts, and the other at the Vanover Fine Arts Gallery in Springville, New York, through November 3rd. Cemetery Travel: What sparked your interest in cemeteries in the first place? John Thomas Grant: My art evolved in a search for my family roots. Genealogy brought me to the cemetery. I bought my first digital camera 10 years ago or so, to photograph my dearly departed family, and sell some stuff on eBay. Guess which one I’m doing better at? Anyway, what the living wouldn’t discuss, or couldn’t remember, the dead were more than happy to divulge; so off I went to the cemetery with pencil, paper, and camera in hand. Calvary Cemetery in Queens, New York, where most of my family resides, is where I had my epiphany. I’d finished paying my respects and began to wander aimlessly from section to section, stone to stone. Reading names, dates, poetic little sayings of remembrance: between the birth and death dates was a life. It all became crystal clear to me. I truly realized that one day I will experience death. That little thought caused me to realize life! That might seem silly, but most people are in denial of death. They believe that, somehow their spirits, if not their lives, will carry on in some way. For their sakes, I hope they’re right! I carry no assumptions, though. I just don’t know. Nobody really knows. In the meantime, I choose to do what is right and good in that which I know: my life. John Thomas Grant: My feeling for cemeteries comes strictly from an artistic, and life, point of view. Should I learn something about architecture and/or history, well, all the better. Seven or eight years ago, I was neither a photographer nor a taphophile. I’m not necessarily sure that I would consider myself safe in either camp yet, but I do have a good eye, and creative mind, for art. John Thomas Grant: Don’t! You’re not alone. I hear from many that were introduced to cemeteries by their parents when they were youngsters. They have not forgotten those moments, yet they are not what one would consider a taphophile. Look, cemeteries are not spooky and creepy. We really do have to get away from that mindset. It’s not good for us as individuals, nor as a society. A ‘Cemetery’ is just another way of saying ‘Home.’ Start looking at them in that way. It’s time to grow up, people. John Thomas Grant: The cemetery doesn’t matter to me. There are so many that I have yet to see. It’s the art and story from life, which can be captured in any of them. That said, my favorite cemetery is, unquestionably, Green-Wood Cemetery in Brooklyn, New York. Not only was it one of the first to influence my work, but it was my oasis in Brooklyn. The distant din of the metropolis, the song of birds, the peace, the expanse, complete with the occasional flyby ‘howdy’ from Junior the red-tailed hawk: Green-Wood has character, a personality, and it speaks to me. For all intents and purpose, I disappear. It was, and continues to be, my Neverland. John Thomas Grant: It really is not about the architecture for me, though I do admire the work. It’s about the composition of stones and who the stone is honoring. Let me explain. Some of you are familiar with one of my pieces, the one I call “Eternal Love.” It’s a photograph of two unremarkable stones except for the fact that one has ‘wife’ engraved on it and the other ‘husband.’ The ‘husband’ is tipped and leaning on his ‘wife,’ who happens to be standing tall and straight. That is the quintessential ‘Grant’ image. Those two rather plain stones mean more to me than any highly ornate stone or grand mausoleum. John Thomas Grant: The one that I have not yet seen. 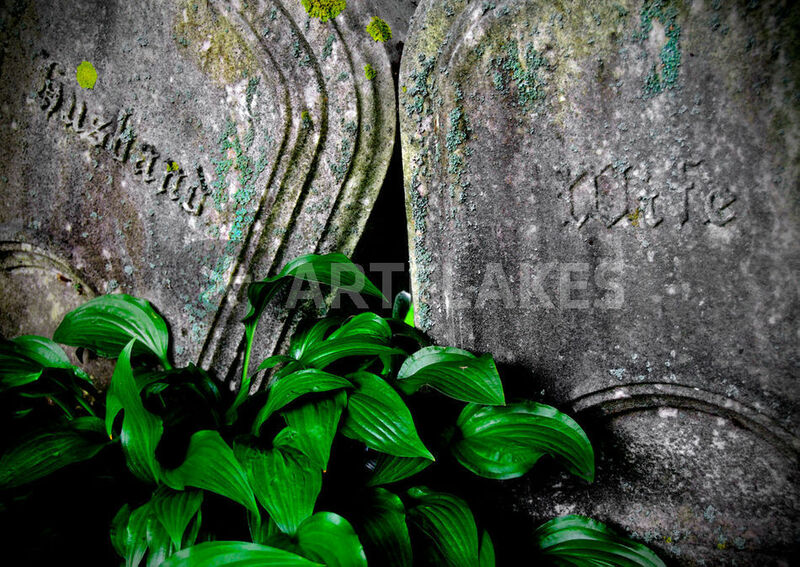 It’s all about the ‘art’ of cemetery photography. I’m as pleased with a small roadside pocket cemetery as I am in a vast garden variety. Cemetery Travel: Do you have any advice for someone setting out to photograph cemeteries? 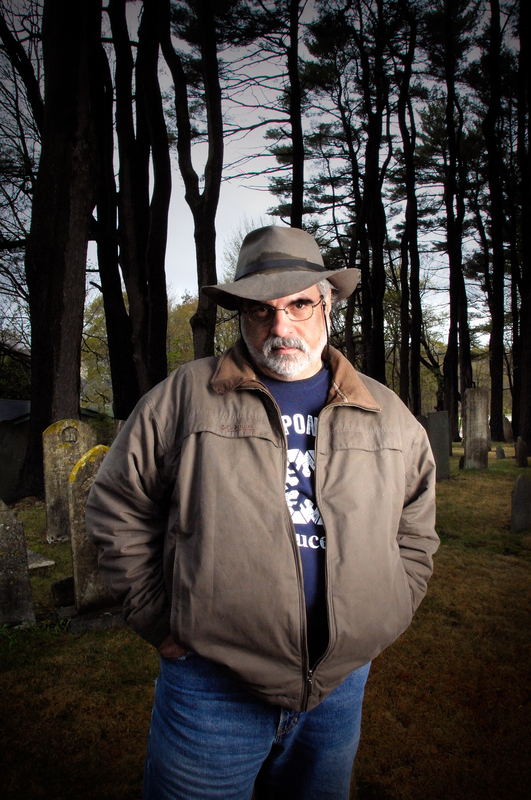 John Thomas Grant: Anyone can shoot cemeteries, but if you want to create art, well, then, patience! I’ve waited seasons for just the right photo. For equipment, I started with an Olympus point-and-shoot. Now I have a Nikon D300 and I use CS3 for processing. But, as I have learned, the equipment is not nearly as important as the eye behind it. It’s not what you look at that matters; it’s what you see. Cemetery Travel: Are you working on any new cemetery-related projects now? John Thomas Grant: I’m currently building two books for future release: Death In Color and my opus The American Cemetery. These should take the better part of 10 years to create. I’m also working on a couple of Civil War-related books. Anyway, at this relatively late stage of life, I cannot truthfully realize a large catalogue of books, so I’ll pick the two cemetery themes that are most important to me and get going on them. If I’m permitted a few more years, then I’ll reconsider a few other titles whirling around in my head. John Thomas Grant: Get involved, start a preservation group, align with other organizations in your state. Just so much as taking care of a single forgotten individual will go a long way. Sometimes I’ll have lunch in the children’s section of a local cemetery. It’s just a home and they were just people. Signed copies of Final Thoughts: Eternal Beauty in Stone can be obtained by emailing John Thomas Grant. You can also order directly from Amazon: Final Thoughts: Eternal Beauty in Stone or from Barnes & Noble. This entry was posted in Cemetery interview and tagged cemetery books, cemetery photographs. Bookmark the permalink. Completely AWESOME post and interview!!! I’m requesting his book through interlibrary loan tomorrow and can’t wait to look at it!! That is the best response to one of my columns EVER. Thanks, Jo! The pleasure was mine, John. Thanks for being a willing subject. I was able to get this book, Final Thoughts, through interlibrary loan —- and what I can say is —- Wow! The photography is so beautiful! I haven’t been to any of the cemeteries in the book, so I made some notes on where I wouldn’t mind visiting. Thanks again for your post, Loren! You’re so welcome! John’s photos are some of the best.